At Nikon's annual Small World Photomicrography Competition, scientists and professional photographers work together to capture the freakiest of the teensiest and tiniest flora and fauna on film. The unseen world they shoot is beautiful... in a terrifying sort of way. 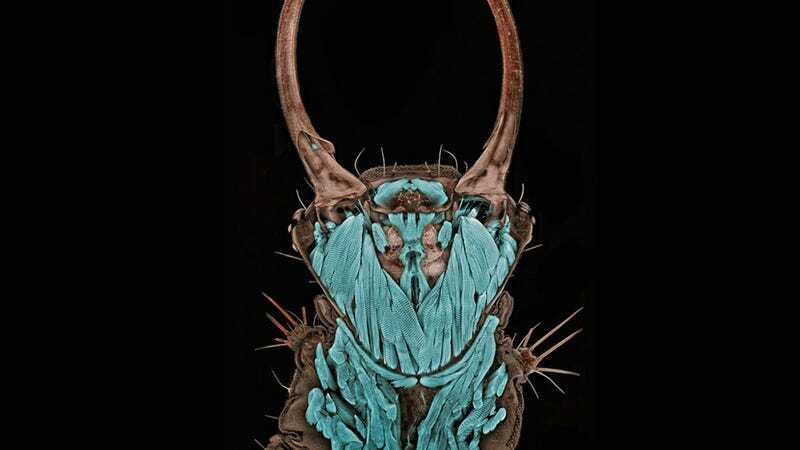 The image you see up there was taken by Dr. Igor Siwanowicz, and it depicts a common green lacewing larva. Clearly posing as some sort of demon ready to eat your soul through your face. That's what I see anyway. This flying sauce was taken by Pekka Honkakoski of Finland, and it's really a column snowflake caught in red and blue light. Its gaze kind of burns right into you doesn't it? Yup. That's a fish louse, taken by Wim van Egmond of the Netherlands. These are the immortal HeLa cancer cells taken at 300x by Thomas Deerinck from the National Center for Microscopy and Imaging Research in La Jolla, California. Finally, these orbs resting so peacefully on some alien shore are actually the eyes of a jumping spider, captured by one Walter Piorkowski. You can keep up with Kwame Opam, the author of this post, on Twitter, Facebook, and occasionally Google+.